What Day Of The Week Was February 19, 1937? 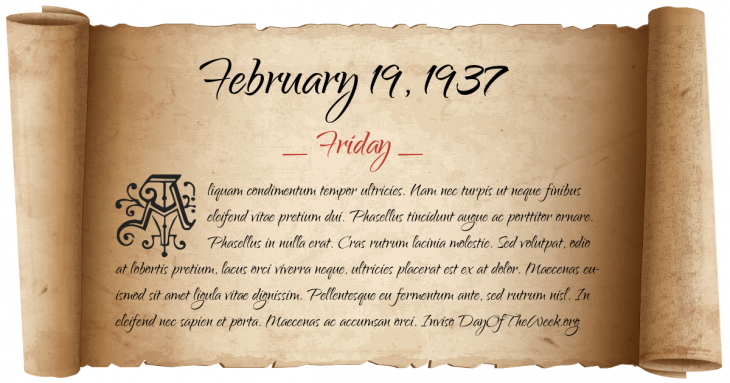 February 19, 1937 was the 50th day of the year 1937 in the Gregorian calendar. There were 315 days remaining until the end of the year. The day of the week was Friday. A person born on this day will be 82 years old today. If that same person saved a dollar every day starting at age 5, then by now that person has accumulated $28,184.00 today. Yekatit 12: During a public ceremony at the Viceregal Palace (the former Imperial residence) in Addis Ababa, Ethiopia, two Eritrean nationalists attempt to kill viceroy Rodolfo Graziani with a number of grenades. Italian authorities exact vicious reprisals on the population. Who was born on February 19, 1937?